Oh Baby,” can be both an exclamation, and apparently a work of art, depending on where it’s uttered. Greeting visitors at the door to Proto Gallery, Marta Buda’s sculpture hangs as both, declaring a monumental endeavor taken on by Nick De Pirro; two shows, two spaces, inside one colossal factory. “Twilight of the Idols,” Proto Gallery’s punch in the face, serves as the threshold, a path to cross, but in itself an event. Curated by Rob Ventura, a painter with a studio behind the walls of the gallery, the shows name references a quote by Nietzsche about the iconoclasm of philosophical ideas; the power of theory as simultaneously the standard and foundation of its own destruction. The show captures a similar impulse, the conceptual power of art to cerebrally assault the mind behind an aesthetic wallop of visual pleasure. 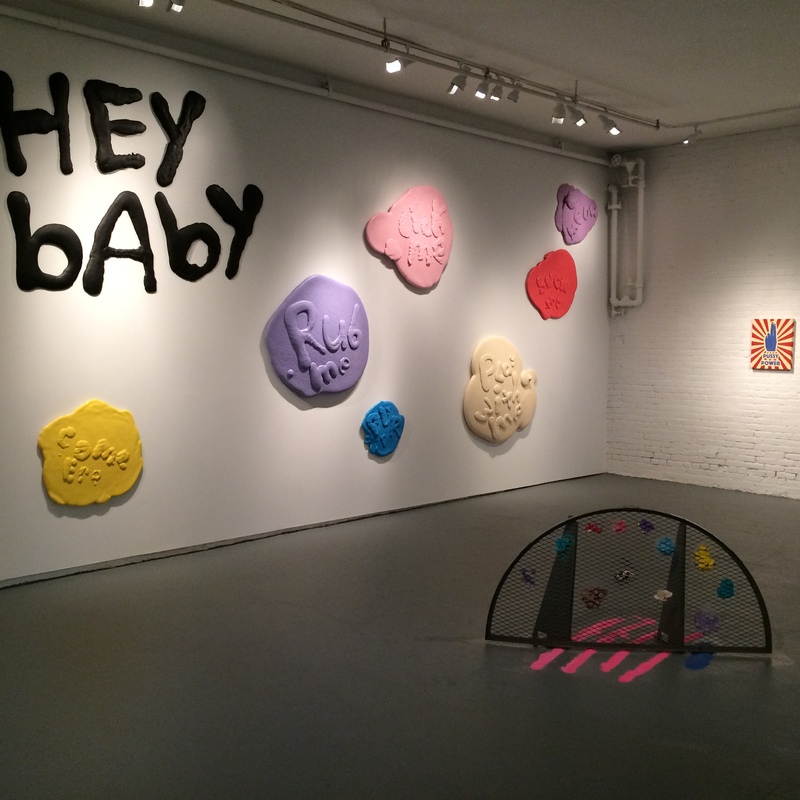 Joining “Oh Baby” on the inside of the gallery, “Hey baby” flips the statement into an invitation. 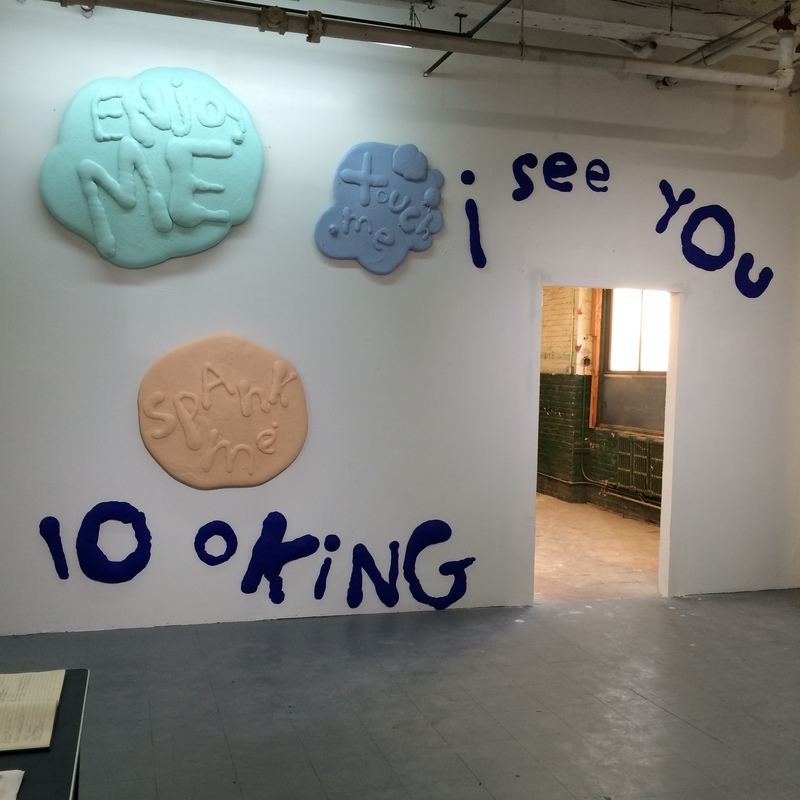 Sculptures such as “come ere” “Rub me” and “Play with me” on the back wall, visually rich in bubblegum colors and thick foam, serve as foreplay to the exhibition; Dirty talk to get the viewer into the mood. MEGALODON, much like the prehistoric shark, is colossal; housed at Neumann Leathers Factory, an old converted factory that serves as studio spaces; the name of the show is a metaphor of its own curation, it’s big. The first and most present aspect of the show is the space and how the work manages to fill it out. A large space can infantilize work, shrinking a piece’s presence to a dot against a white wall, but MEGALODON reads like a crescendo, with work of all sizes peaking into a total experience. Easily the largest piece in the show, against the back wall to the right as you enter the space, is the painting by Raymond Saá, a work literally overtaking the wall. Measuring from floor to ceiling, the work is a syncopated design in primary black, white, red, yellow, and blue. Made up of individual parts creating a whole, the work has a variable nature, measuring its own presence against the space it occupies, Saá both calls to the challenge of MEGALODON in size, but offers a dilemma in a piece which has the potential to be bigger than the space it occupies. Directly across from the work on the far wall, A painting by Rob Ventura accepts another challenge by the MEGALODON; not matching it in size, although the painting is large by painting standard, robs work is an test of paintings history. Layering images of AbEx era abstract monoliths, Rob employs ”Paint by Numbers” approach to his appropriation, rendering layers of aggressive painting as flat as the pixels sourcing the work. The final nail, large areas covered in black paint, areas of focus becoming redactions within the composition, serving as much as a blockade as a mark. To the right of Rob and Reaching from floor to ceiling, but announcing its presence in terms of text rather than scale, Enrico Gomez’s “Boom” drawing constructs a visual chain that leads the viewer up and down the refinished white wall of the old warehouse. Playing with language of the original industrial space, while retaining the pop charm of a comic, “Boom” broadcasts big; like a support beam in the factory structure, the piece is necessary to hold the weighted show as well as subtle enough to pull in the attention of a viewer for more than a quick pass; additionally it functions to cut off the formalism of Rob’s piece from more of the pop of Marta’s sculptures. Reading from left to right, boom gives way to “looking, Enjoy me, Spank me” more text heavy bubblegum pop sculptures by Marta Buda. The iconoclash of the work from “Twilight of the Idols” carries over to MEGALODON as a footnote; the sculptures echoing in the gallery like a voice in a canyon instead of holding the authority the few words seized in the smaller scaled show; the moment when an unstoppable force meets an immovable object. Leading into more figuration in the sea of conceptual abstractions, Catherine Haggarty’s painting, Everybody Eats, constructs a dinner scene in a provisional mix of phthalo green like a neon salad served in a red light district. The central figure is pushed against a perspectivaly flat dinner table in the center of the canvas. Although strategically devoid of food, the sketch outline constructing the figure as well as the handprint stencils spray painted on the table, suggest a visual consumption. The work is tiered; the central figure at the lowest register, cut off by the table, which is ultimately underneath four arc shapes, either the backs of chairs or church window-like forms. Surrounding the scene is painted wheat, both setting this dinner party in a field, but suggestive of the daily bread, deifying a universal daily act that all people eat for survival. With more work than possible to consume in a single sitting, MEGALODON is an accomplishment of scale and curation. As Nick De Pirro, the president of Proto gallery and curator for MEGALODON explained, the space has the potential to be as great of an art destination as New York, and with the scale of the show and engaging curatorial decisions, the potential for another epic is far from extinct.